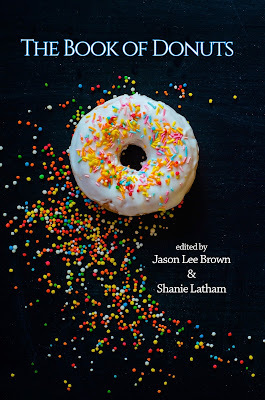 On Sunday, October 15, a group of poets gathered at the West Caldwell Public Library in NJ to celebrate the publication of The Book of Donuts, an anthology published by my press, Terrapin Books. Given that the poets in the book come from places far and wide (e.g., California, Wisconsin, Texas, Indonesia), I was delighted that eight poets were able to participate in the reading. Brent Pallas came from NYC, Anne Sandor from NY State, Marjorie Maddox from PA, and Anne Harding Woodworth came all the way from Washington, DC. Each poet read their own poem, plus another by a poet not present. We sold a nice bunch of books and enjoyed a book signing. We also had a reception with donuts and tea. The donuts were generously donated by Glaze, a new donut shop in town. They make donuts fresh each day and seem to have an endless variety. They were delicious! We ate an impressive number. This was a lovely reading, festive and full of wonderful poems and good spirit. The Book of Donuts, edited by Jason Lee Brown and Shanie Latham, is available at Amazon or in the Terrapin Bookstore. I am thrilled to be participating in this poetry festival on Saturday, October 21. Organized by the fabulous poet and human being BJ Ward, the event includes 13 NJ poets, all of whom have read at past Geraldine R. Dodge Poetry Festivals. The purpose of the event is to celebrate the 30th anniversary of the Dodge Festival. 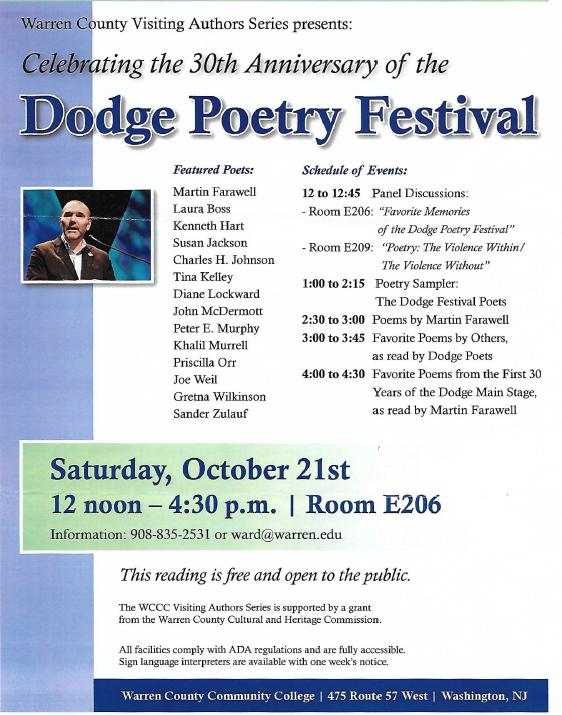 I'll be participating in a panel discussion on "Favorite Memories of the Dodge Poetry Festival" and two Sampler readings. For the first Sampler each of the poets will read 2-3 favorite poems of their own. For the second Sampler, each poet will read one poem by another poet featured at a past festival. It should be a fabulous day—and all the more so if you're there too! All are invited to stay and join the poets for conversation and Donuts!